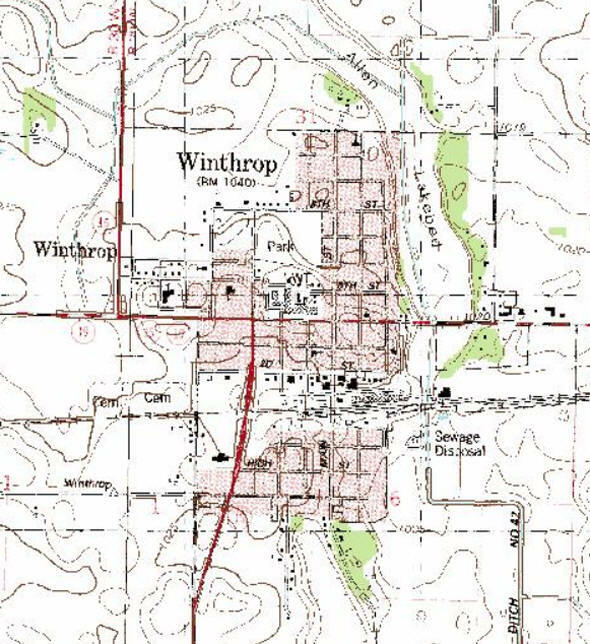 Do you have photos, historical accounts or other items pertaining to the Winthrop area? Would you like to share this historical information with the world? LakesnWoods.com would like to publish your Winthrop photos (current or historical) or historical accounts on this website. Original materials can be returned and your privacy will be respected. The City of Winthrop is located 80 miles west of Minneapolis. Winthrop is known for its flourishing agriculture industry, specializing in the production of corn and soybeans. It is home to Heartland Corn Products, a farmer-owned cooperative that has become one of the state's leaders in renewable ethanol production. 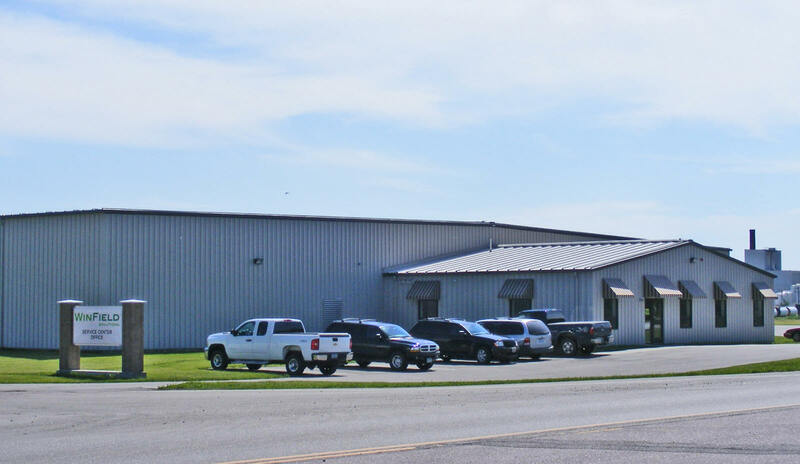 Winthrop is also home to JB Lures, one of the largest fishing lure manufacturers. 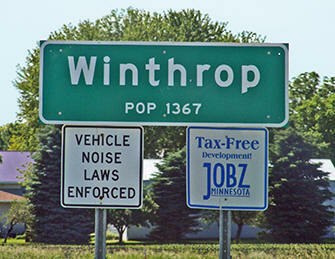 Winthrop is a city in Sibley County, Minnesota. 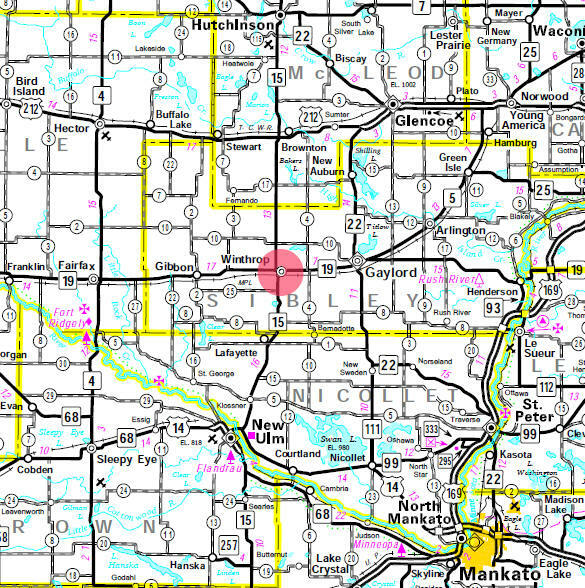 Minnesota State Highways 15 and 19 are two of the main routes in the city. The South Branch of the Rush River starts near Winthrop. According to the United States Census Bureau, the city has a total area of 1.06 square miles (2.75 km2), all of it land. The elevation is 1,037 feet above sea level. As of the census of 2010, there were 1,399 people, 574 households, and 355 families residing in the city. The population density was 1,319.8 inhabitants per square mile (509.6/km2). There were 640 housing units at an average density of 603.8 per square mile (233.1/km2). The racial makeup of the city was 93.4% White, 0.5% African American, 0.7% Native American, 0.5% Asian, 3.9% from other races, and 1.1% from two or more races. Hispanic or Latino of any race were 7.4% of the population. There were 574 households of which 28.0% had children under the age of 18 living with them, 48.6% were married couples living together, 8.7% had a female householder with no husband present, 4.5% had a male householder with no wife present, and 38.2% were non-families. 33.8% of all households were made up of individuals and 18.8% had someone living alone who was 65 years of age or older. The average household size was 2.36 and the average family size was 2.97. The median age in the city was 41.7 years. 25.9% of residents were under the age of 18; 5.1% were between the ages of 18 and 24; 21.7% were from 25 to 44; 25.3% were from 45 to 64; and 22% were 65 years of age or older. The gender makeup of the city was 47.7% male and 52.3% female. 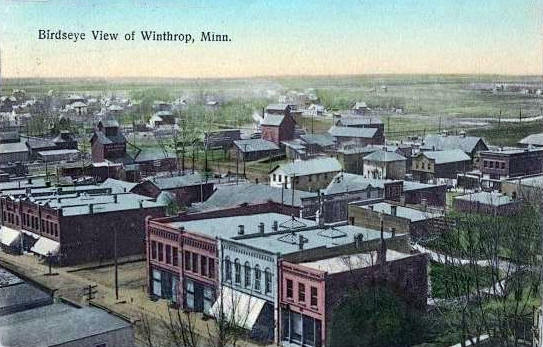 WINTHROP, a city in section 6 of Alfsborg Township and section 31 of Transit Township, incorporated as a village before 1891 and as a city in 1910, was named by officers of the Minneapolis and St. Louis Railroad. 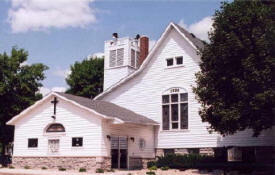 The post office was known as Eagle City, 1858-82, and was first located in Michael Cummings's halfway house and tavern, a stagecoach stop that accommodated travelers on the Old Fort Ridgely Road; the post office was moved in 1868 to Charles A. Swanson's in section 6 of Alfsborg Township, and moved again in 1870 to section 29 of Transit Township and Ole Olson's home until 1881. 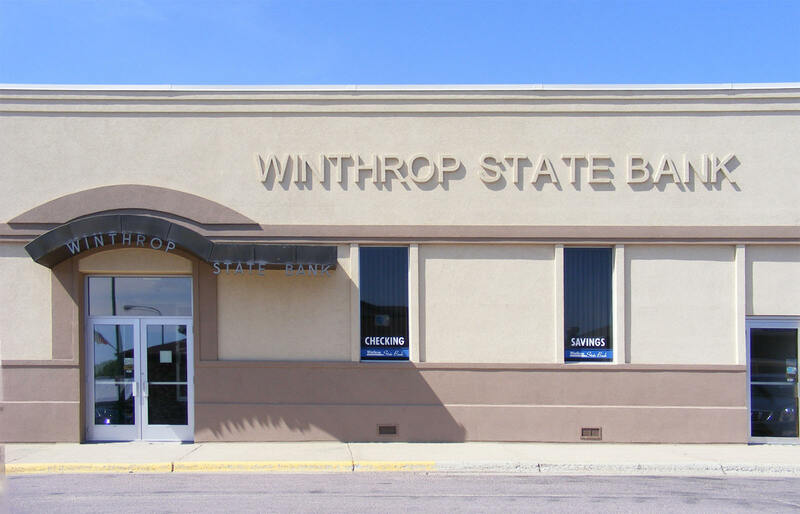 Eagle City was incorporated on May 19, 1857; when Winthrop requested a post office in 1882, Elford Andrew Campbell, then postmaster of Eagle City, moved that post office to Winthrop; Campbell owned a number of buildings, was agent for the land company, and operated a law firm. The townsite was platted on land owned by Erick and Brita Olson, who had homesteaded the land in 1869 and platted the site in 1881. The village had a station serving several rail lines including the Minneapolis and St. Louis Railroad. The 9-hole "Winthrop" course at the Winthrop Golf Club facility in Winthrop, Minnesota features 2,912 yards of golf from the longest tees for a par of 36 . The course rating is 37.0 and it has a slope rating of 119. Winthrop golf course opened in 1930. Sara Giskaaf manages the course as the General Manager. The physicians and staff at Sibley Medical Center and clinics are dedicated to a sole purpose, and that is you. As you will see in exploring this site, we are committed to our mission of making a positive difference in the lives of those we serve and supporting healthier communities and lifestyles within Sibley County. The Winthrop Area Clinic is a full-service clinic with basic on-site lab and radiology capabilities. In addition to services provided on-site, we're backed by the services and specialties offered by New Ulm Medical Center and Allina Hospitals & Clinics. The communities of Gibbon, Fairfax, and Winthrop began sharing educational resources in 1987 and established the GFW School District in 1992. Still remembering the proud heritage of America's heartland, the GFW Schools are renowned for extraordinary educational programs, unequaled by schools of any size. GFW is recognized as a regional model for community-based education. Site-based teams of parents, students, community members, and staff are charged with decision-making at each school. 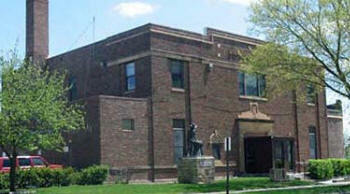 The K-4 Elementary School is located in Gibbon, the 5-8 Middle School at Fairfax, and the 9-12 High School in Winthrop. 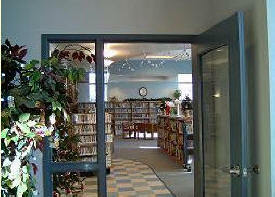 Over 800 students are served in a safe and secure environment. Weekly newspaper published on Wednesdays with a circulation of 1,183. 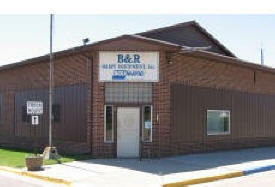 B & R Dairy Equipment, Inc. has been providing quality Sales, Service and Installation to South Central Minnesota dairy farm families since 1980. Our mission is to help dairy farmers produce and harvest quality milk at a profit. We are dealers for BouMatic and DeLaval equipment, but our trained service technicians will service all brands of equipment. Other equipment available through B & R Dairy includes: Dari-Kool® Cooling Systems, CALF-STAR Pasteurizers®, ECONAR® Geo Thermal Ground Source Heat Pumps, NTI High Efficiency Boilers, OxyBlast® Water Treatments, Therma-Stor® Heat Recovery Systems, State Commercial Gas Hot Water Heaters, Schafer Ventilation Systems, MiraFount, Bohlman Livestock Waterers, and more! Hantge Funeral Chapels are family owned and operated. Our commitment to the communities we serve is to provide professional, quality service. We will always treat the families we serve with respect and compassion. We honor the heritage of the communities in which we live and serve. We offer a wide selection of services and locations so that each family in need can choose best how to honor and acknowledge their loved one's life. 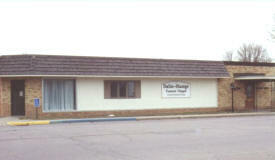 In Business since 1995. 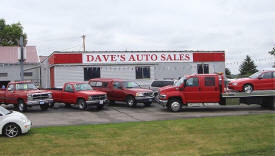 Our Goal is to provide you with a dependable car at a fair price. Most of our cars come from "new" car dealers and have been inspected and test driven by us. We are also your source for Ranch model ATV's and Snowmobiles in season. Providing Chiropractic adjustments using a variety of chiropractic techniques as well as ultrasound and electrical muscle stimulation to help aid in the treatment. Dr Mortensen also provides nutritional counseling and exercises to improve the body's healing ability and provide more stability so regular visits are not required as frequently. Most patients notice significant improvement in their symptoms in 1-3 visits. We know your time is just as valuable as ours and because of this we pride ourselves in seeing all patients usually within 5 minutes of their scheduled time and adhere to a strict schedule to maintain this schedule. We look forward to being able to work with you and your family in improving your health and adding vitality to your life! My father started Guidecraft in 1964 in a small woodshop, producing 10 items. I purchased the company in 1995 and have continued to develop the line, which now includes over 850 educational toys and furnishings. Our size has changed, but our mission remains the same; stay true to the tradition of smart, beautifully crafted wood products, which allow children's minds and imaginations room to truly wonder and grow. As we turn 46, we see that our best contributions lie in this commitment to continue doing what we do best, while always giving our loyal customers what they have come to expect; expert quality, excellent service and an ever growing collection of creativity inspiring products for children. Our playful furniture is a wonderful new extension of our line and we are delighted to present it to you. 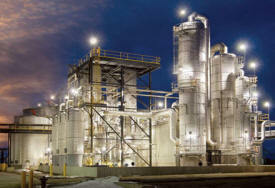 Heartland Corn Products is a major ethanol fuel production facility situated on a 30-acre campus. The project produces fifty million gallons of ethanol annually. We know that yield pays the bills on your farm, and we’re confident we have the best genetics on the market from early Group 00’s to late Group 2’s. Hefty Brand Soybean yield data will be available in university, independent and local yield trials. Hefty Brand has plot winning yields, but equally important is our performance on your tough ground. Whatever challenges your farm faces like high soil pH, soybean cyst nematodes, phytophthora root rot, other diseases, and more; if soybeans will grow in your area, Hefty Brand will perform. “JB” Lures, Inc. is based in Winthrop, which is located in South-Central Minnesota, USA. We offer a wide variety of Fishing Tackle for Open-Water & “Ice-Fishing” “JB” Lures, Inc. is based in Winthrop, which is located in South-Central Minnesota, USA. We offer a wide variety of Fishing Tackle for Open-Water and “Ice-Fishing” We are very proud of the fact that we use entirely “All-American” labor to assemble our product. In fact, home-based workers do most assembly; this approach provides the ultimate in quality to produce our fishing tackle. We know you will appreciate their efforts and work ethics as it is reflected in the finished product. Raw materials purchased to manufacture “JB” lures are of the highest grade possible. Hooks, blades, beads, line, paint and rubber must all meet our standards. 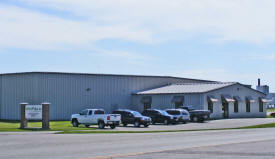 Jackson Electric, Inc. has been providing the Winthrop, MN. 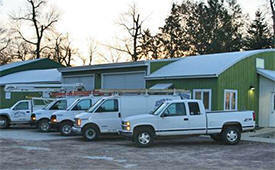 and surrounding area with professional electrical service and repair since 1987. Karla Havemeier, Ltd. is a local Certified Public Accounting firm with two locations, in New Ulm and Winthrop, Minnesota, to serve you. We are excited about the fact that our size gains the client a close relationship with their accountant. Despite being a smaller local accounting firm, we are proud to offer a wide array of services! At Karla Havemeier, Ltd., our clients are #1. We believe in prompt, excellent client service. As Certified Public Accountants, we are trusted advisors. Our purpose is to assist our clients to attain their financial goals. Whether it’s tax, accounting, attest or consulting services, we value every business relationship and strive for client satisfaction. Professional Custom Home Construction, Design, Remodeling and Renovation Building or remodeling your home can be an exciting time, and a bit daunting. 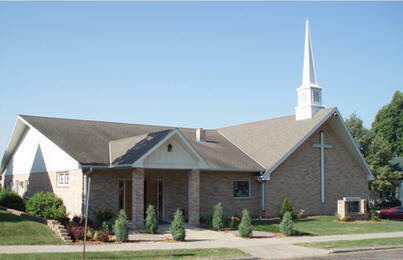 At Messner Builders, Inc. we are experts in design and building of new homes, additions, remodeling and renovation. We know it is our job to make sure your project is completed to your standards. With award-winning service, value-oriented products and conveniently located branch offices, MidCountry Bank is a great choice for all of your financial needs. Stop in today at your local branch to meet your friendly bank team members and find out why MidCountry Bank is the bank for you! Midwest Financial Processing (MFP) is a company that offers a wide variety of products to businesses that find themselves in need of an ATM, Safe, Surveillance Equipment and Credit Card Processing. 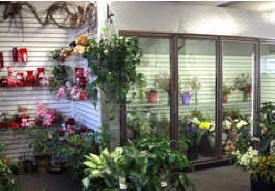 What we are most proud of is our level of customer service and technical support. We know your experience with our company will result in you becoming a customer for life. More than 85 years ago, the National Automotive Parts Association was founded to meet America’s growing need for an effective auto parts distribution system. NAPA has been the industry leader ever since and an invaluable partner in the flow of parts from manufacturers to NAPA AUTO PARTS Stores. Photographic Keepsakes, has been specializing in professional portrait photography in South Central Minnesota for 20 years. Photographing 1000's of people each year, at our photography studio and on location. Ranging from high school seniors, families, children, weddings, business portraits, school pictures, commercial photography, not to mention dance schools in five states. Photographic Keepsake's work can be found in homes all over Minnesota and the United States. We combine our professional experience and photographic knowledge with today's technology to create lasting images that you will love for generations to come. 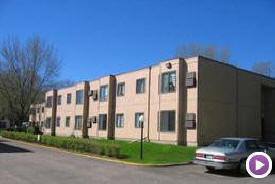 Sibley Estates West offers everything you need and deserve at an affordable price. Our community is designed for seniors 62 years of age or better, or people with disabilities. Our one bedroom apartments feature controlled access to the building, an elevator for convenience, a social room for entertainment, a large laundry room, and a friendly caring staff. 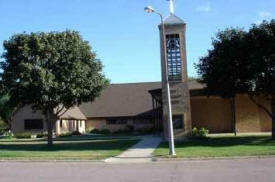 Sibley Estates West is located on the south west side of Winthrop in the quiet outskirts of town. Come and tour today! We are committed to quality and service. Our 100% Satisfaction Guarantee is our personal commitment to creating long term relationships with our customers. Your satisfaction is our Number One priority, not just because it's our job, but because we care. Whether you want to convey sympathy, encouragement, love, or simply want to let someone know you care, we have a wide array of bouquets to choose from, or we can put together something special just for you. 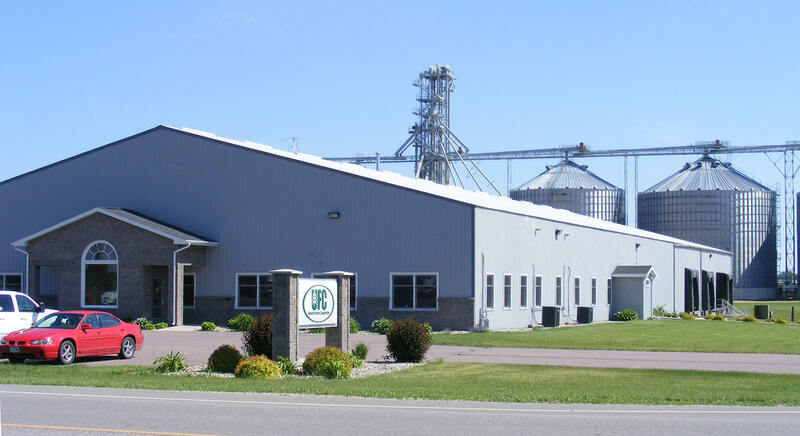 United Farmers Cooperative provides a wide range of agriculture products and services to our members throughout southern Minnesota. People....Pride....Purpose....is our motto and focus since 1915. Our team of experienced employees works daily to provide you with the technology, products and services you need to enhance your agriculture operations and daily lives. Times are changing in agriculture—United Farmers Cooperative is your producer-owned cooperative that is always planning ahead and leading the way to your operation’s successful future.